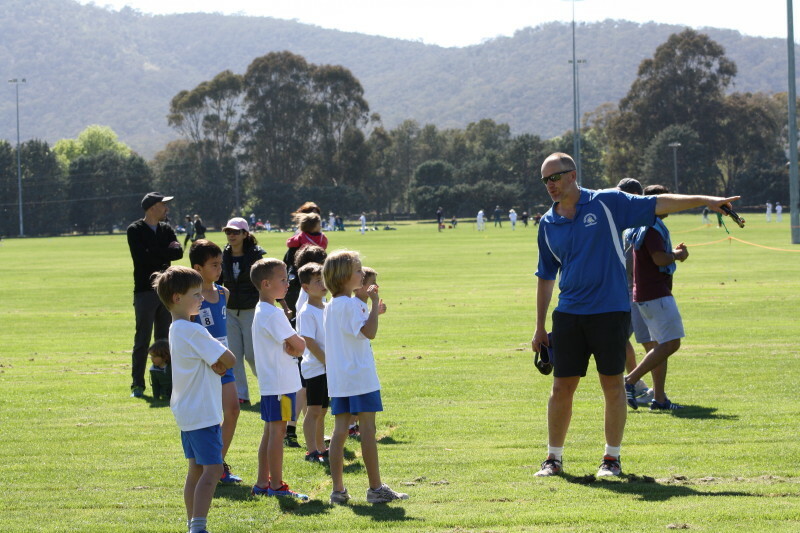 John became involved in the ACT Little Athletics in 1984, joining the Association’s Board in its formative years when it split from the Monaro Zone. Since that time and up until 2009 when he retired, John was an active member of the Board, always contributing to Board deliberations and was never afraid to put forward a different point of view to ensure the board considered all important aspects before making a decision. John brought to the Board an intimate knowledge of the regulatory environment and a tremendous depth of experience within the athletics community in general. 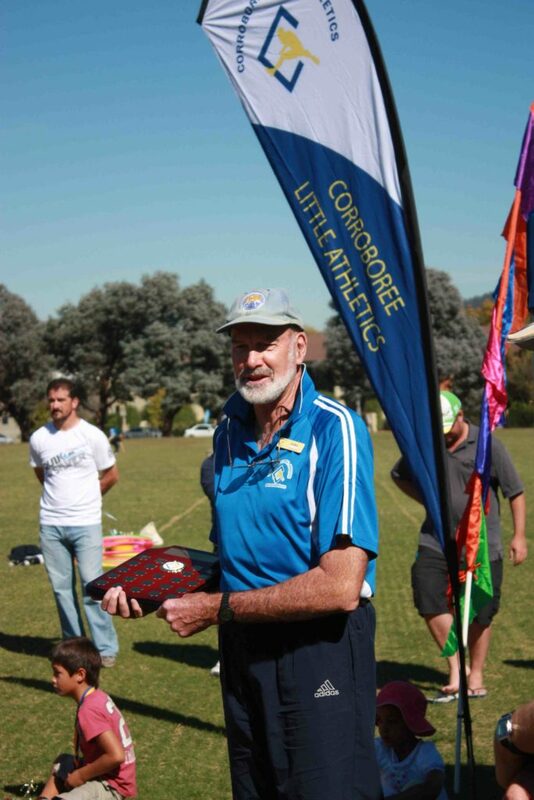 John’s involvement with (Corroboree North Canberra) Little Athletics began in 1988 when his son joined our club. Since this time John has been on the Corroboree committee for almost every year since then (only handing over the reins in 2011) and his tenure included many years as Club President. At Club level, John has also been heavily involved in coaching and has represented the Club officiating at just about every ACT Little Athletics carnival, as either Field Referee or Chief Official for Jumps for as long as anyone can remember. Many of our older athletes (Under 8’s and above) who commenced Little Athletics in Under 6’s will have their skills initially developed by John when her took responsibility for the On-Track Program. John, as Head Coach, has also taken responsibility for running the Monday and Wednesday training sessions for many years to the benefit over 100’s of Little Athletes. His results are best demonstrated by the many personal bests achieved by the children under his tutelage each year. John is also extremely well known to all in the broader ACT athletics community. Coaching high jump is John’s passion and the children under his tutelage look up to and respect him as a person with great knowledge of the event. John has coached most young high jumpers in the ACT at some point at his Sunday training sessions at the AIS Track. John is acknowledged as one of the pre-eminent high jump coaches in the ACT. Apart from being awarded Life Membership of the ACTLAA a few years ago, John was awarded a Thanks Award by the ACT Minister for Tourism, Sport and Recreation, Mr Andrew Barr MLA, in October 2010 for his contribution to athletics in a voluntary capacity. John has also been recognised by our Club by having our Club Person of the Year Award named after him. Andrew came to Corroboree Little Athletics in 2006, when his oldest daughter, Skye, started as an U6 athlete. Right from the start, Andrew became an active and passionate volunteer for the Club, taking on the role of Age group coordinator for the U6 girls. The following season, he joined the Committee, and was a member of Corroboree’s executive for nine years: as Treasurer (2007–2009), Vice President (2009–2010) and President (2010–2016). While he handed over the reins two years ago, he continues to be active as a general Committee member, sharing his knowledge and advice, and helping at Corroboree meets in many ways. Andrew strived to improve all aspects of the Club and its operations. As Treasurer, he turned the Club’s finances around, taking the Club from a non-compliant entity to one with cash flow that could afford to purchase new equipment. Andrew is an accredited coach and has lent his skills to many athletes during meets and at bi-weekly training sessions. Under Andrew’s leadership the Club has flourished, both in terms of athlete numbers and in its stature. Andrew has always been focused on the ‘Family and Fun’ aspects of Little Athletics, and has fostered a club culture, whereby giving it a go, focusing on PBs and supporting others is more important than competitiveness and results. Over the years, he worked to improve and optimize the programs of the Saturday morning meets, of which we still see the benefits with meets that generally run smoothly and finish on time. During his time in the Committee’s executive (9 years) Andrew hardly ever missed a meet. After stepping down from the leadership role, he continued to attend most meets, meaning that by now he would have been at about 150 Club meets! All of these times, he arrived early (8 am) for set-up and stayed late for pack-up. For many years he has been the straight-track starter, but in recent years he has ventured out to support the senior’s groups and help wherever required. Since his youngest daughter, Bonnie, started participating in para events, Andrew has become more interested and focused on inclusion, and has been supporting the para events at ACT Championships. Andrew was awarded the John Hunt Award together with Bonnie in 2016. So, for the last 12 years, Andrew has been a committed and dedicated Club member; always first to roll up his sleeves and get the job done. Andrew’s passion for junior sport, whether it be athletics or hockey, is testament to his commitment to his family, and community. You would be hard pressed to calculate the hours he has devoted. Finally, not unimportantly, Andrew is known to bring chocolate to Committee meetings, much to the delight of others. For all this and more, the Committee agreed that Andrew will be awarded Life Membership of Corroboree Little Athletics. Ruud and Ingrid and their two children Lizanne (U9s) and Mischa (U6s) joined Corroboree at the commencement of the 2010-11 season and immediately became actively involved and embraced all that was special about Corroboree. Ruud’s vast experience in athletics became apparent very quickly and this saw him drafted into assisting in the running of On-Track and in the role of Carnival Manager for one of the carnivals that season. At the end of the season I, as President, approached Ingrid who, like Ruud, had immediately shown a strong interest and commitment to Little Athletics, to take on the role of Vice President. I still remember the conversation vividly – she firstly made sure I wasn’t going anywhere in the next year or so before agreeing to take on the role. Fortunately I was in a position to assure her that was the case and Ingrid agreed to step up. In her first year as VP Ingrid was more than happy to put her efforts into anything that needed doing. We were going through a lot of change and the first thing that took her focus was updating our very old Constitution, not the most exciting role, but one that was necessary and as a result of her work, the Constitution has required little to no change since then. Ruud in the meantime took on a key role supporting John Hunt as a member of our coaching ranks, having migrated from The Netherlands as a Level 2 Coach. This was finally accredited in 2017-18 as a Level 4 Specialist Coach (Sprints, Relays Hurdles) and Level 3 Advanced Event Group Coach after many years wrangling with bureaucracy! At the end of the 2012-13 season Ruud was awarded the John Hunt Award. This was in recognition for his outstanding efforts throughout the season, not just in regards to the above which he did as a matter of course each week, but also for taking on the thankless but extremely challenging role of the Northside Regional Championships Manager. Ruud also acted as the Assistant Chief at the ACT Championships and became involved in ALAC. At the end of the 2014-15 Ingrid was recognised for her outstanding and consistent efforts in also being the recipient of the John Hunt Award. As I described Ingrid when delivering my President’s Report at the AGM “Ingrid is very much the glue that keeps us all on track. Her family are obviously all passionate about athletics and Corroboree and Ingrid best exemplifies the culture of the Club. Whilst I remained President until the conclusion of the 2015-16 season, Ingrid had already in effect taken on that role. As I was quietly withdrawing myself from running the Club, Ingrid stepped up and whilst she had some reservations about taking on the role of President, there was no doubt in my and the rest of the Club’s mind that she was right for the role. Ingrid continued in the role of President for 2 seasons, stepping down at the end of the 2017-18 after being on the Executive for 7 years, but has continued to remain on the Committee this year. In the meantime, Ruud’s contributions to Little Athletics also continued unabated. Not only did he take on an ever increasing role at the ACT Level acting as Referee for Field Events at every Carnival and Championships, he became involved at the ALAC level initially as Assistant Coach and then in recent years taking on the Coaching role, one that he has filled with great regard..
One of the things that Ruud does behind the scenes that demonstrates perfectly his commitment to Corroboree is whenever hurdles is on the program on a Saturday morning, he spends quite a few hours marking out the positioning for all the hurdles so that the Meet runs so much more effectively than it would. He is also the man who marks all the Javelin throwing areas, fixes those tapes that get broken at Saturdays meets, glues High Jump bars back together, delivers tents to carnivals when the association asks for our assistance, acts as selector and manager for representative teams and the list goes on. Also of note, Ruud was nominated in the Volunteer category for the ACT at the last National Roll of Honour awards for Little Athletics; while Ingrid was in her final year of her Club Presidency when Corroboree was awarded the LAACT’s Club of the Year. These are both recognition of their commitment to Little Athletics. In a way this is very much reflective of both Ingrid’s and Ruud’s contributions to our great Club, but also to Little Athletics generally. Neither seek the limelight in what they do preferring to undertake their roles quietly and effectively. Both have been consistently and actively involved in each and every Saturday morning Athletics Meet getting there first thing to help with set-up, helping run athletic events either as a coach, timer or whatever role needed filling, as well as being the last to leave after everything was packed away. I can remember either not being present at our meets on a handful occasions and invariably it is because they were involved at another ACT or National Athletics Meet. Not only are Ruud and Ingrid so committed to Corroboree and Little Athletics in general, they do it in a way that reflects so positively on our Club, our sport and especially themselves. They are always very positive, very calm, but assertive when needs be. In taking on challenging roles whether it be Ingrid as President or Vice-President, organiser of Officials at Carnivals/Championships etc or Ruud as Carnival/Championships Manager or Field Referee, their personalities ensures that they get the results desired or required, but they bring everyone on board in doing so. Ruud has also become highly regarded as a coach having that perfect balance between seriousness and having fun, but also getting the best out of the athletes. Before I conclude, I think it also worthy mentioning both their children Lizanne and Mischa. Their ongoing love of athletics has helped ensure that Ruud and Ingrid have remained engaged with not only the sport but especially Corroboree, so thank you to both. In some ways I think the love of athletics is mutual and has certainly played a strong part in the strong family bond between the four of them.